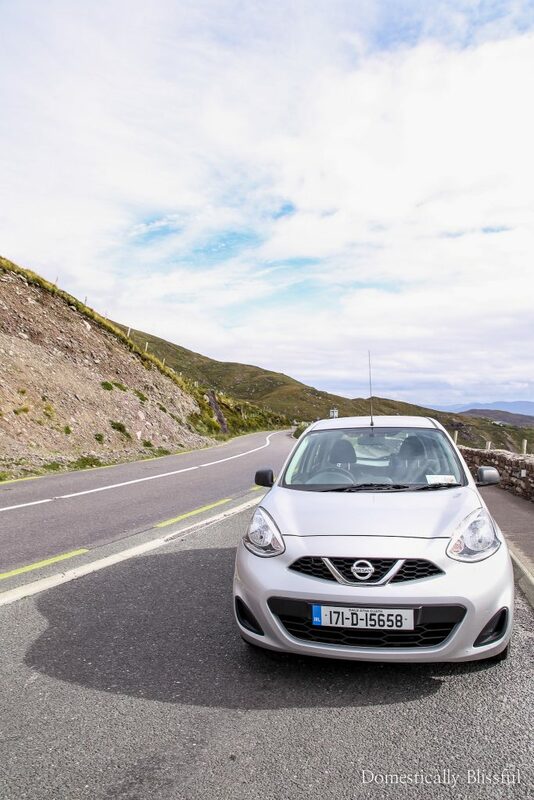 10 things you need to know before driving in Ireland & road tripping around the country. I was for sure that our first European driving experience was going to be just like our first vacation experience together on our honeymoon in Antigua. Last year when we went to Paris, Rome, & Barcelona I was adamant that I would pay for transfers everywhere because traveling to Europe for this first time & experiencing 3 new cities in 8 days was plenty of adventure for me without adding on the potential stress of driving. So even though this was 6+ years after our honeymoon, I was prepared for a rough first hour or two as he adjusted to driving on the left side of the road while driving manual with his left hand. After we got into the car he did two quick laps around the parking garage to get the hang of it before heading out onto the outskirt streets of Dublin. Before getting onto the interstate we drove to a brunch spot about a mile down the road which gave him some extra practice driving on the left side with his left hand on the stick shift. This gave him a 5-minute taste of driving & by the time we stopped for brunch I knew I had nothing to be worried about. Our Ireland road trip was the best vacation we have ever experienced thus far in our marriage. I 100% recommend skipping the tour buses & opting for a road trip around Ireland. Not only is it not scary, but it’s a whole lot of fun being able to have the freedom to stop anytime you want & explore the hidden treasures of Ireland. 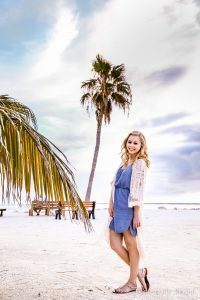 I hope these 10 tips help you as you prepare for one of the most beautiful road trips! An easy trick that we adopted early on is for me to (very) kindly remind him to stay left everytime we got into the car at the beginning of the day or after stopping to eat or walk around somewhere. As long as he kept himself centered next to traffic & me protected against the side of the road then he would know he was driving correctly. Our biggest struggle was that when we would go to get in the car we both went to the wrong side of the car. If you don’t have someone driving in the passenger seat that can help you remember to drive on the left then be sure to bring some sticky notes with you to stick on the dashboard or on the center of your steering wheel that says to “keep to the left”. It’s also really nice that when you leave the airport rental car garage that there are signs that remind you to keep left. There was also a sticker on the passenger’s side of the windshield with a note that said to keep left. Most cars in Ireland are manual & if you want to drive an automatic it will cost you quite a bit extra & you will want to reserve it well in advance (especially during tourist season) or you will run the risk of there not being any left on the lot. When I was 15 my father taught me to drive in a manual truck, but then my mode of transportation when I was 16 became my moms old mini-van & I never drove a manual car again. Roger, however, drove a manual car for about 10 years before getting his first automatic car a couple of years ago, so he had quite a bit of experience under his belt. But even if you have driven automatic your entire life it will be different in Ireland as you will be using your left hand to change gears instead of your right. Luckily Roger adapted pretty quickly & it wasn’t an issue. But if driving a manual car stresses you out, the last thing you will want to do while driving on the left side of the road in a foreign country is to be driving a manual car also. It may cost you extra, but if it gives you peace of mind & a more enjoyable trip than you may want to opt for an automatic car. We purchased our flight, car, & one night stay in Dublin through Orbitz & when we checked out we opted to pay for full car insurance through them. When we talked to the agent in Dublin he said that if we didn’t buy their insurance that they would need to put a large hold on our credit card. Since we had already bought insurance we opted for this & we received our money back at the end of the trip. I should also note that even though I paid for the trip with my credit cards they had to have Roger’s credit card for the hold since he was the one driving the car. This is a huge bonus! Some Europian Countries require an International Driving Permit, but luckily Ireland is NOT one of them! Your USA license will work just fine in Ireland! As we were driving around Ireland it became pretty apparent that roundabouts are standard for directing converging traffic. While there are red lights in Dublin, the majority of Ireland is filled with roundabouts instead. We discovered that it was a safe bet to stay in the far left lane when entering a roundabout so that you don’t cut anyone off while trying to exit. This isn’t an issue with a small roundabout with just one lane, but for the roundabouts, with 2 lanes we found that the far left lane was the best one to be in when entering a roundabout. Since we chose to do an Ireland road trip we didn’t spend a whole lot of time in big cities like Dublin, I think only 2 or 3 times (when we were in a bigger city) did the left lane immediately exit to the left. But you can usually see that the road is going to do this before you enter the roundabout, plus GPS can help you navigate the roundabout, usually, it will tell you which lane to be in! We discovered that our phone maps were more accurate in Ireland than in the U.S. I can’t count how many times our GPS has tried to take us to the wrong place in America, especially in downtown ATL. We used my phone’s maps basically nonstop during our Ireland road trip & only once did it try to lead us astray. And it wasn’t really “astray” it just tried to take us down a secondary (more obscure) back road to our resort that wasn’t the main entrance of the resort we were staying at one night. Roger & I kept exclaiming how surprised we were with how good our google maps app was with navigating small back roads, giving accurate directions on which lane to be in while in Dublin, & even while navigating the endless array of roundabouts. After we booked our trip & before we arrived in Ireland we started to worry that our luggage might be too large for the trunk of their small cars. Online it said we had rented a Volkswagon Up 4-5 door or a similar model. Even though it was just the two of us we had packed two separate semi-large suitcases because we knew to go to Ireland in September meant we would need extra layers to keep warm. Luckily we had no problem fitting both suitcases & his backpack in the backseat. Since this was a road trip we spent every night in a different hotel/castle/resort, which meant we got smart our second day & put down the back seat so that we could easily get our luggage in & out of the trunk even if there were cars right next to us. Our mini rental car actually got pretty good gas mileage, however, when we did have to fill up it was rather expensive! When we went in September 2018 it was about $60-80 to fill the car up all the way, and this was a very small car with a little gas tank, the prices on the signs are for Liters, not gallons like in the USA. Also, we discovered that the Irish are very trusting when it comes to paying for gas. And while I realize that they probably have security cameras I still was amazed to find out that you fill up your car fully before going inside to pay. There was no pre-pay at the gas stations we stopped at. We quickly realized that there is not a lot of police. While in the U.S.A. we are pretty used to cops hiding on the sides of interstates & backroads (even in small towns) with their speed guns pointed at oncoming traffic in order to pull over speeders, this is not something that we saw in Ireland at all. Right now I’m down at Roger’s office in Dalton & I am working at a window above the street. I’ve seen more cop cars in the 6ish hours that I’ve sat here than I did during our 4-day road trip in Ireland. Of course, I am not saying you should speed, it is just something we noticed while driving in Ireland. And speaking of speeding, there were some crazy speed limits in Ireland. Don’t feel pressured to drive as fast as some of them say, especially on the smaller roads between towns. One day, while we were driving down some smaller back roads in Ireland the speed limit was about double what we could have really driven down this particularly small windy road without killing ourselves & anyone driving on the other side of the road. If you do find yourself driving slower than the speed limit & someone comes up behind you, be sure to pull over to the side (or pull off completely if it is a tiny back road) so that the driver behind you can safely pass you. 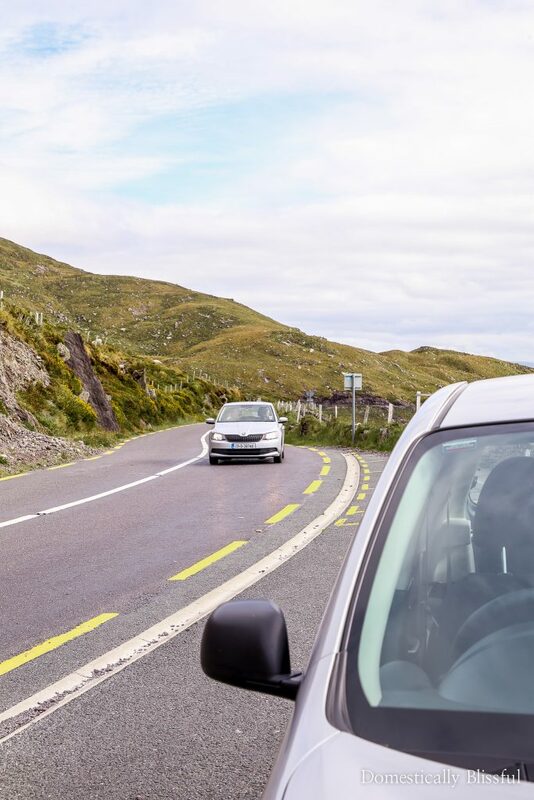 In Ireland, the passing lane is the one closest to the center of the road, and you should not stay in that lane if there are more than one lane going in each direction. People tend to get a little angry if you just stay driving in the fast lane as people do in the USA. So keep to the outside lane if you are a slower driver. Calling it a lane is kind of misleading though on smaller roads where it’s actually just a large shoulder, so cars can pass near the center of the road. You will see cars, trucks, & semis pull off to the left shoulder (while still driving – not stopping at all) so that you can pass them on the right. When you pass you will be half in your lane & half in the lane of oncoming traffic. So you have to make sure that there is minimal to no oncoming traffic when you pass. I know that sounds kind of intimidating, but it’s really not that bad. 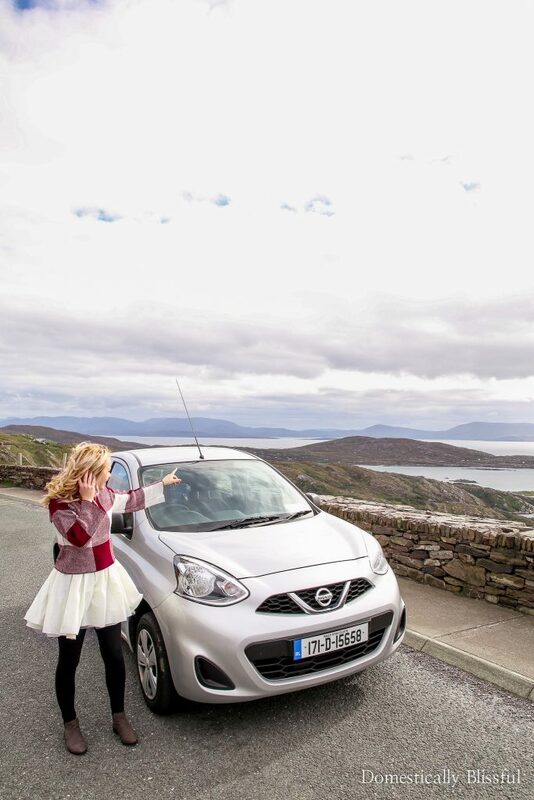 On our last day in Ireland, it was especially windy & driving in a little car like we had meant that our car was quite often being bullied & pushed around by the wind. So if it is a windy day be sure to keep both hands firmly on the steering wheel. I know I originally said 10 tips, but I kept thinking of more! I figured you wouldn’t mind some extra Ireland driving tips. 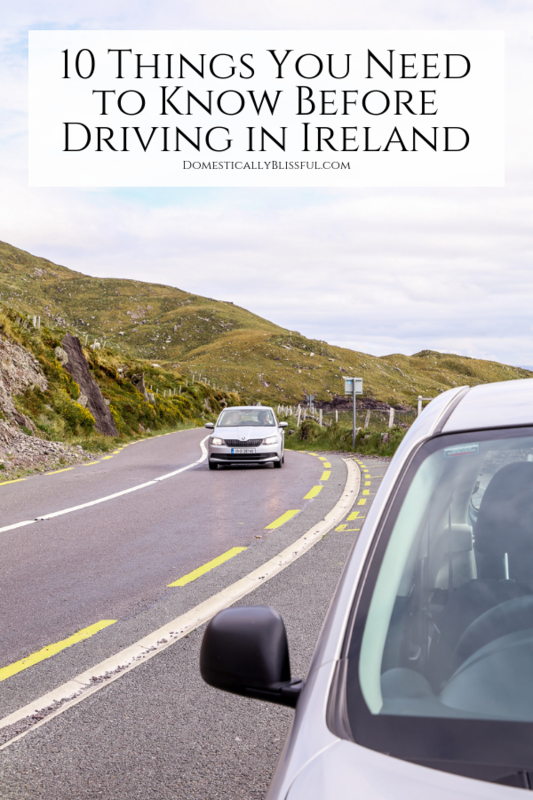 So I hope you found these 12 tips helpful & that you feel more prepared for driving in Ireland! I have a lot more blog posts on Ireland to come as well as some that I have already shared. Click here to read all of my tips & advice posts on Ireland. And if you enjoyed these tips, be sure to subscribe to my newsletter below so that you don’t miss out on another blissful tip! 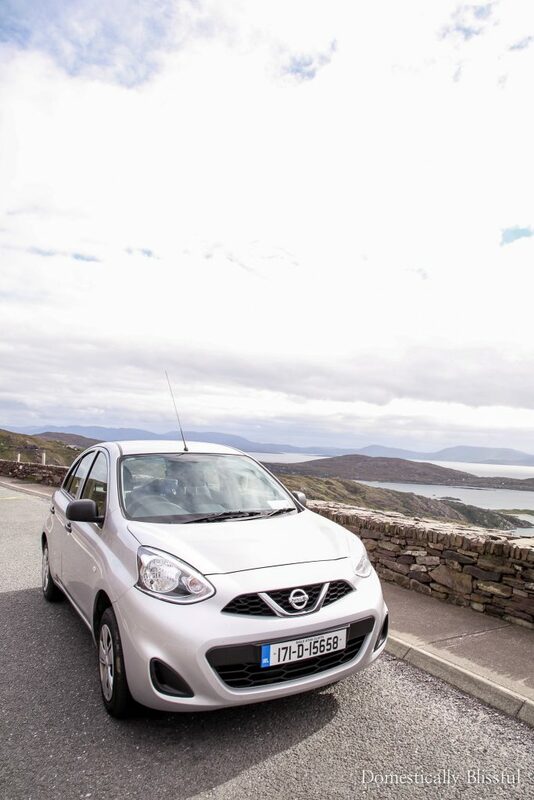 Do you have any tips for driving in Ireland?